French and Scottish fur traders arrived at Hudson’s Bay in the 17th century, trapping across the drainage basin of the bay and beyond. Some settled and married Native women. Their descendants came to be known as the Métis. Drawing from Native and European ancestry, the Métis became intermediaries between traders and Native peoples and created a distinct culture of their own. While the Métis maintained separate communities in the south, in the north they remained primarily a part of the respective Native societies. Mission schools, founded to teach Christianity to Native peoples and children of Europeans, also taught domestic arts of sewing and embroidery in the European tradition. European-style clothing was encouraged and quickly became part of the Métis wardrobe, however Métis preferred tanned hide to woven cloth, adorning clothing with intricate beadwork and/or embroidery. European embroidery techniques were quickly adapted to work with traditional Native motifs. Métis beadwork was highly prized, and the Métis were, in fact, called the “flower beadwork people.” This was a part of their blended culture. 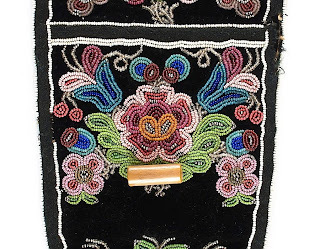 The black velvet beaded pouches and buckskin jacket show the intricate designs favored by Métis beaders and illustrate their skill and artistry. Floral motifs have an almost three-dimensional quality and often exhibit symmetrical designs of great intricacy. Each bead is sewn in place using a two-thread, couching technique. 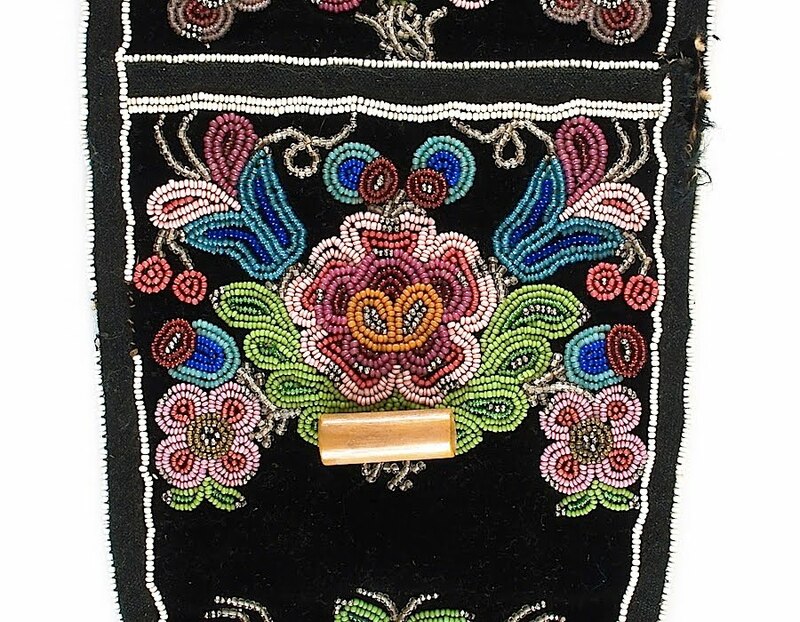 Women who specialized in beadwork were highly respected and their work was of great value and sought after by the local community and collectors. Most of the glass beads originally come from Bohemia or Italy, where traditional beadmakers specialized in creating specific colors, according to secret recipes. Often recipes were not passed on, and the color was lost forever. Collected by Samuel Washburn between 1897 and 1905, and donated to the Museum of Natural and Cultural History by his niece Jessie B. Sterne, in 1959, these objects came from the Mackenzie and Hay River region of northwestern Canada, traditional territory of the Athabaskan Dene people. Photography by Chris White, text by Beverly Fernandes, and web development by Keith Hamm. Images © UO Museum of Natural and Cultural History. thanks for posting this Jessica! I've seen a lot of beadwork that looks like this with the curving tendrils and the use of the faceted silver beads. That's so cool. I'd often wondered how this distinct are developed.